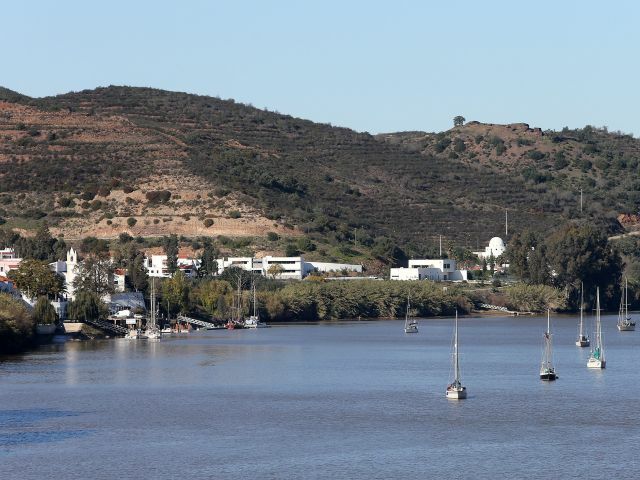 An international team of Portuguese and Austrian archaeologists have discovered the remains of a Roman ruin believed to date back to the first or second century B.C., on the banks of the Guadiana River in Alcoutim. Having started their dig in 2008 and concluded this summer, the team unearthed the ruin in the village of Laranjeiras, where other Roman artefacts had already been found. At present the site is covered with plastic sheets to protect the walls of what is the ground floor of the ruin, which have survived for more than 2,000 years and measure almost 2.5 metres in height. On the international team of archaeologists was Alexandra Gradim, from Alcoutim council, who worked alongside researchers from Innsbruck University, Austria. “We are talking about a building that the excavations revealed as having at least one wall that measured more than 2.35 metres in height and we are talking about the ground floor alone, because the building would have had more than three floors, or in other words, another two floors, and it would have been seen as colossal to whoever came across the river; it must have measured some ten metres in height and 13.5 metres in width”, Alexandra Gradim explained to Lusa News Agency. “The building itself was built parallel to the river, the main facades are parallel to the Guadiana, and it is located on the most bendy part, which winds to Alcoutim. I am certain that this building is located here because of a commercial relationship that arrived via the Guadiana River”, the Portuguese archaeologist said. The researchers believe the building would have been used for commercial purposes as no remnants of a possible military past were found. “We couldn’t find any type of object that indicates military use; metallic objects are few and far between, but, in compensation, what we did find were a number of bits from ceramic pieces which aren’t complete, but we have the outlines of pitchers that came from beyond here, from the Mediterranean, from Italy, the bay of Cadiz, and these are proof that there was a commercial relationship taking place here”, Alexandra Gradim explained. Despite its history there are several obstacles that impede the public from visiting the ruin, such as its location in an area that is difficult to access, and the high costs involved in conserving it for show. Therefore the ruin is to remain covered, protected from the elements, to try and conserve as best possible what is left of one of the oldest buildings in Alcoutim.